As an educator or a parent, you probably have those moments in your family room or on a long car ride when you wonder why you gave in and let the kids veg out in front of Disney Channel or one of their favorite Disney films. Maybe you felt a tad guilty. But did you ever consider what Disney characters can teach us about teaching? Caffeine and Kindergarten invites you to take a closer look at the lessons to be learned about quality teaching methods, the dos and don’ts, and your students’ needs in the classroom. She’s been labeled a bibliophile, a puzzle, and the first feminist princess, among other things. But is Belle, from Disney’s classic Beauty and the Beast, also the ideal student? If we compare her to others in fictional schoolroom situations–Pinocchio, Alice, Pete (from Pete’s Dragon), Nemo, or the preschoolers in Toy Story 3– she’s a model student. The smart kid of every teacher’s dream. You may even consider her “gifted” material, or at the very least, an overachiever. While parents and teachers may be quick to say they prefer a Belle in the classroom, students of this caliber come with a distinct set of challenges. The best way to teach gifted kids is to throw a ton of extra resources at them. Most gifted kids are well-adjusted and happy in the classroom. Dedicated gifted programs are elitist and by extension, so are the kids. Gifted kids never need help and do just fine on their own. There is a seemingly endless supply of websites, books, workshops, and teaching curriculum to help classroom instructors, or parents, “unwrap” the gifted child and engage the high level thinkers. No single resource is the end-all-be-all authority on how to handle the educational needs of the Belles you may know. Still, common threads exist in the long list of best practices, tips, and tricks out there. Below you’ll find some on which most experts and educators agree. BELLE: Good morning, sir. I’ve come to return the book I borrowed. Not only is reading a lot and reading a variety critical to gifted education, but so is repetition. The habit and pure joy of reading. The beauty of Belle is her love of the act of reading, not simply knowledge gained by reading. Allowing a student to reread a favorite isn’t a waste of time. Including fiction and fairytale into the steady nonfiction/biographical diet of a gifted reader, likewise, is not a travesty. In fact, it inspires. So it’s absolutely okay if her nose is stuck in a book. Many teachers make the mistake of believing that handing over data or getting straight into difficult concepts is the best way to engage high-ability learners. But as our Disney heroine demonstrates, it is the discovery process that counts. Ownership of the process may be more important than what is uncovered. Means over ends. This boils down to a “less is more” approach in which a teacher creates space for discovery and then allows it to happen. 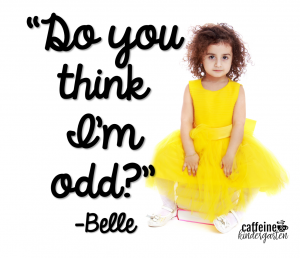 Do You Think I’m Odd? According to the National Research Center for the Gifted and Talented, while a connection between suicide/depression and giftedness is rare, characteristics often associated with gifted students can be viewed as risk factors for clinical depression, suicide, and low self esteem. Perfectionism, performance-driven stress, cynicism, the Impostor Syndrome–all could play a part in the life of an overachiever. Educators must broaden their understanding of “at risk” children to include far more than poverty-level, single-parent, urban core kids. Encouragement, affirmation, positive reinforcement, and acceptance are necessary components to successful teachers of students like Belle. One trait gifted students share with other classmates is the need to feel affirmed and operate in a safe environment. All students, including students with above-average intelligence, are more likely to take learning risks when they feel safe. When the Beast endeavors to give Belle something, an interesting discussion ensues. LUMIERE: Ah, no, no, it has to be something very special. Something that sparks her interest. Everyone knows what happens next. She’s given a grand library. But it’s vital to understand that it wasn’t simply the scores of books lining the floor-to-ceiling shelves. It was the safety and refuge of a designated space where Belle was assured that she could be herself, even in the midst of an uncertain circumstance in her life. A puzzle to the rest, perhaps. But for teachers and parents willing to be intentional about mentorship and student-sensitive methods, this puzzle is starting to come together, revealing a truly beautiful thing.